The roots of the Yosemite Transportation started in Merced in 1886. CORNER MAIN ST. AND HUFFMAN AVENUE. Business of E. M. Stoddard & Son. 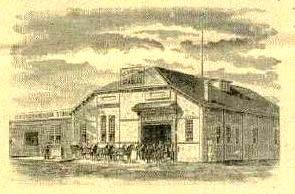 These stables are the pioneer livery stables of Merced, and were established by the late M. McClenathan in 1872. The property was purchased by Messrs. Simonson and Stoddard in June 1886. The building was burned in October, 1886. The present buildings were opened for business in July, 1887. It is first- class in every respect, having a frontage of 100 feet on Main street and 105 feet on Huffman Avenue.